Security Executive that has been working in IT since 1987 and with a special focus on Information Security since 1996. Mr. Siepmann has worked with leading consulting organizations and Fortune 100 organizations in leadership positions. Security Executive with over 29 years of IT and 17 years of Information Security experience, leading matrixed security organizations and programs with globally dispersed teams. He has been known to challenge the status quo by creating new value propositions. Core expertise include International Security Programs, GRC, Privacy, IAM/IDM, Application and Cloud Security. With over 7 years of his career at leading Big-4 consulting companies in executive or senior management roles he has worked for many Fortune 100 companies. Some of his roles include Director of Information Security for a $4B business unit, Security Executive (CISO) for the largest outsourcing deal of a Big-4 consulting company and Security Architect for the cloud initiative of a Fortune 10 financial institution. In 2008 he established his own security consulting company 1SSA, providing services to U.S. government entities and commercial companies in the U.S. and Europe. He has presented at International Security Conferences and has published throughout his whole career. His first book is scheduled for release in 2013. Mr. Siepmann holds a degree in Electrical Engineering with a specialization in Industrial Control Systems (ICS). He worked as an ICS expert between 1987 and 1991 at Bayer AG. 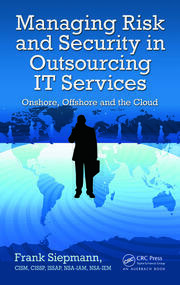 - Impact of outsourced operations on the overall risk posture of an organization. - Risks, Security and safety of Industrial Control Systems in an Internet connect industry.